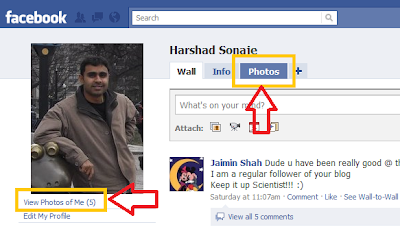 Home Facebook Tips How to Tech Tip How to find all the photos you are tagged in Facebook? How to find all the photos you are tagged in Facebook? Are you wanting to know what all pics your friends have tagged you in or just out of curiosity you want to know your popularity in face book?Now a days people feel really proud that they are tagged in hundreds of photos and in a way it also indicates how social (actually social not virtually) you are. Well If you want to know what all photos of yours have been tagged then just follow these simple steps. The Photos of section will show all your tagged photos. Other way is to click on View Photos of Me just below your profile pic and you will be redirected to all your tagged photos. If you want to untag your self then here is a tip for you.